We have a new behind the scenes photo from Star Wars 9 to speculate hopelessly about. 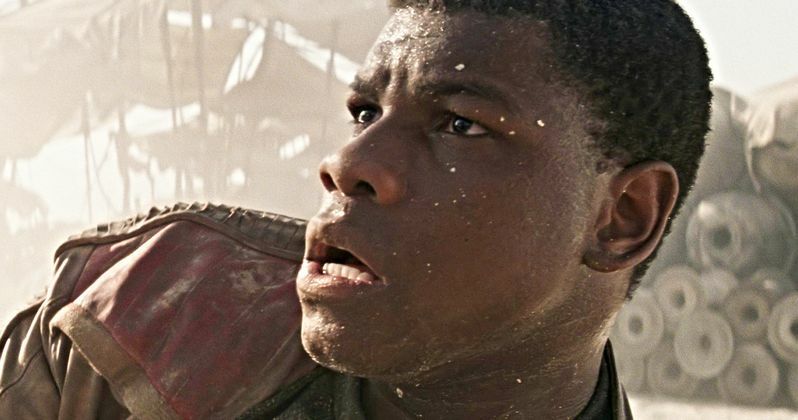 As these things go, John Boyega, who plays Finn in the new trilogy, has been about as active on social media as one can be on such a secretive project. Lucasfilm doesn't like much of anything to be revealed from the set, but Boyega gives us a little taste when and where he can. In this case, it's not so much the photo as it is what the actor had to say about it. Taking to Instagram, John Boyega shared an image of his hands, which are very roughed up, with his thumb even sporting a little spot of blood. Whether that's actual blood that was shed for his craft or something we should credit to the makeup department isn't clear. But that's really all we see, so there isn't much too discern from the image alone. However, Boyega's caption does have some substance to it. Here's what he had to say about it. "Great working day on set!! The whole team pushed themselves today to achieve something visually crazy! I've had many moments of shock on set but not like today and I can't wait until you know why #FN2187." He even added the FN2187 hashtag as a nod to his former Stormtrooper identity. Given that this is a Star Wars movie, it's not necessarily a stretch to imagine that we're going to see some visually impressive stuff. But John Boyega has done two of these movies already, not to mention Pacific Rim: Uprising. The dude has been around some visually crazy stuff in the past. So for him to hype this up, whatever it is, so specifically, means it could be something rather memorable. But without any further context, it's nearly impossible to speculate as to what this could be. However, for the time being, this is all we've really got. Director J.J. Abrams is always pretty secretive with his projects, but especially when it comes to anything set in a galaxy far, far away. We don't even have an official title yet. Though, we're assuming/hoping that will be revealed prior to Star Wars Celebration in April. Whatever visual craziness awaits us later this year, Star Wars 9 is certainly burdened with expectations. Fans remain divided on The Last Jedi and, unfortunately, Solo, though embraced my many, didn't do the franchise any big favors. Needless to say, there is a lot riding on this. Can J.J. Abrams get it right with his final chapter of the Skywalker saga? Fingers are currently crossed. Star Wars Episode IX is set to hit theaters on December 20. Be sure to check out the new behind the scenes photo from John Boyega's Instagram below and feel free to speculate wildly as to what it could all be about.